This program includes permaculture & natural building workshops at Jean’s Farm with food and lodging, plus participation in other community projects and programs during the 19th annual VBC, from May 31-June 9, 2019. For the upcoming VBC, Jean’s Farm will build upon successive years of growing connections with friends in Japan to provide a rich, cross-cultural community-building opportunity. Our projects for this year include building an earthen Japanese-style double rocket stove as well as a timber-framed fruit arbor using cedar logs from the land. Throughout the program there will be permaculture lessons and demonstrations in natural building, nature connection, sustainable living skills and organic farming. For most evenings, we will attend the VBC speaker series (including Mark Lakeman, other presenters not yet announced) which includes a City Repair workshop called the Village Building Design Course. Matt Bibeau, CEO of IPEC and manager of Jean’s Farm, will host your stay in Portland and at the farm. Kyle Holzhueter of the Japan-based Permaculture Center Kamimomi will teach building a double rocket stove. Kazuko Jimoto of Permaculture Center Kamimomi will offer lessons on traditional cooking and will also prepare Japanese-style lunches using many ingredients from the farm. Jason Proffer, a Portland-based carpenter who has built many structures at Jean’s Farm, will lead the project of creating a fruit arbor from site-harvested cedar logs. Henry Soto, CSA farmer at Jean’s Farm, will lead garden activities on Fridays and other specified days. Steve Johnson, owner of Jean’s Farm and long-time Portland environmental activist, will share stories. Lena Moon, gardener, healer and flower essence herbalist, will offer a workshop on herbal medicine and will share her skills in cooking Lebanese cuisine. Leanne Mruzik, a Board member of IPEC, will help support projects and activities through volunteer coordination. A Japanese-speaking member of the City Repair team will provide interpretation support, site tours and camp hosting. What is the Village Building Convergence? The Village Building Convergence (VBC) is an annual community-building event that empowers city residents to organize and transform their neighborhoods into more sustainable, connective places through a coordinated building project. Approaching its 19th year, there have been over 400 projects organized and built in coordination with the VBC, and countless others inspired by it. During the days of the 10-day event, upwards of 30 different projects—ranging in style from natural building, ecological gardening and public art—are happening simultaneously, and during most evenings, there are events at a central venue, usually including a dinner, inspiring presenters, and some musical performances. On some days in the afternoon, we will tour other exciting Village Building Convergence projects across Portland that demonstrate natural building, ecological gardening, public art, and building community. Most evenings we will attend the VBC speaker and music series and a City Repair workshop series on placemaking. Dinners will be provided. Jean’s Farm is located along Johnson Creek in Southeast Portland. The farm provides fresh, organic food through a CSA and hosts events and classes in permaculture, farming, nature conection and sustainability for adults and children. Jean’s Farm now also serves as a cultural connection between Portland and Japan. Plan your travel to arrive at Jean’s Farm in Portland between 4pm May 30 (PST) and 4pm May 31 (PST). Public transportation options are available from the airport to Jean’s Farm. Lodging options include a shared yurt dorm or a private tent. For all options, a sleeping pad, bedding and pillow are included. 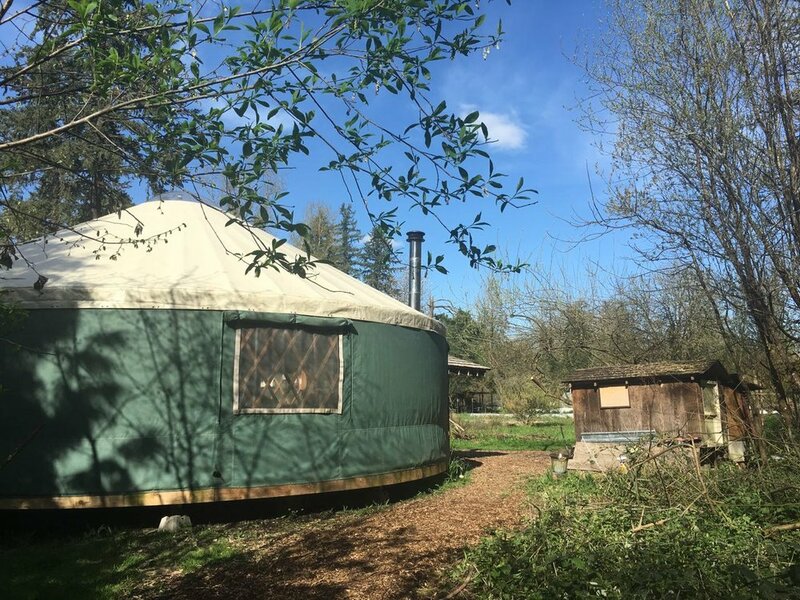 The yurt will provide floor mats in separate men’s and women’s sleeping areas. The private tent will provide sleeping pad, futon or air mattress for 1-3 people. 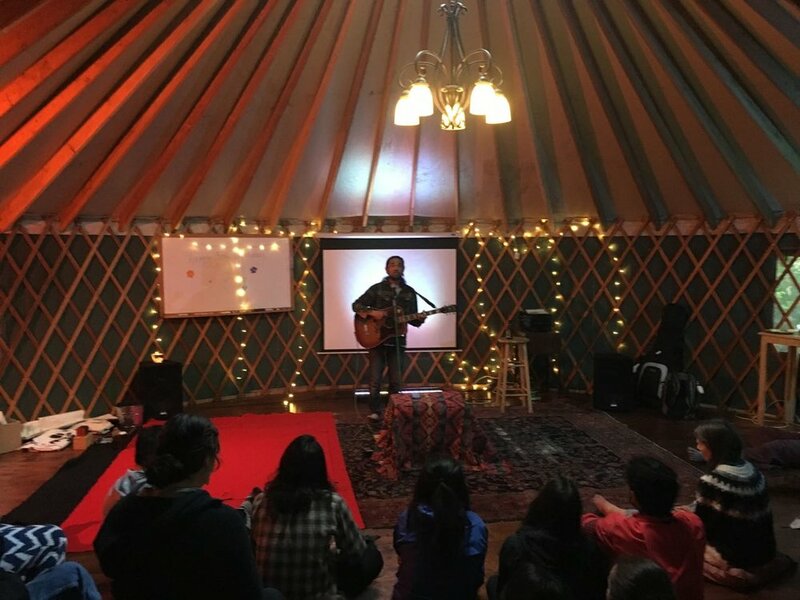 $1750 program fee includes up to 10 nights lodging in our yurt dorm (some guests may prefer to arrive on Thursday, May 30th). There is an additional fee for a private tent. Meals, instruction and participation in Village Building Convergence daytime and evening events are included. Any decision to go to a restaurant would be a personal expense. Participants are responsible for their public transportation fees. REGISTER BELOW. Spaces are limited! In 2017, Shintaro Kuyama, a Shinto priest in Okayama, Japan and friend of Jean’s Farm, joined our VBC torii project to lead the ceremonial preparations and traditional blessing. The torii project was born out of a vision in 2015, and after two years of preparation and using trees from Jean’s Farm, the timbers were prepared following Shintaro’s instructions and assistance. 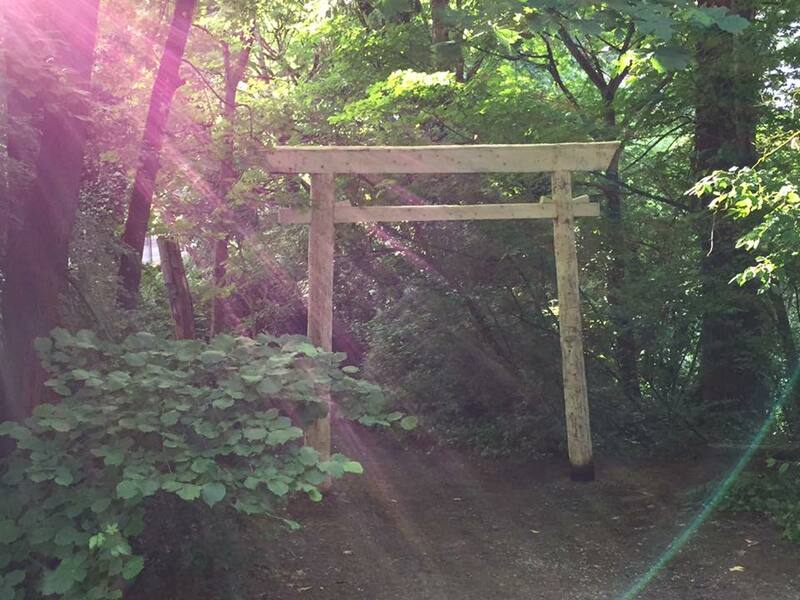 Now the completed torii stands as not just a passageway into the sacred land of the farm, but it also serves as a connection to our farm’s growing community across Japan. Later in 2017, Yohei Miyake visited Jean’s Farm for the first time, and a plan was made to return for the 2018 VBC. In 2018, Yohei Miyake joined Matt Bibeau at the Village Building Convergence in Portland, Oregon. A very special Japanese culture-themed evening of the VBC took place at Jean’s Farm that included music by Yohei Miyake and and live art by Sora Shodo, followed by a presentation by Larry Korn, scholar of the work of Masanobu Fukuoka and translator of his famous book, One Straw Revolution. Shortly after, a plan was made to make a program in Portland specifically for our Japanese community, where the farm provides our learning and our lodging, and the city provides many more opportunities to experience placemaking and urban permaculture.